The Topo Suspension light from Tech Lighting is simple in design yet elegant in visual aesthetic. 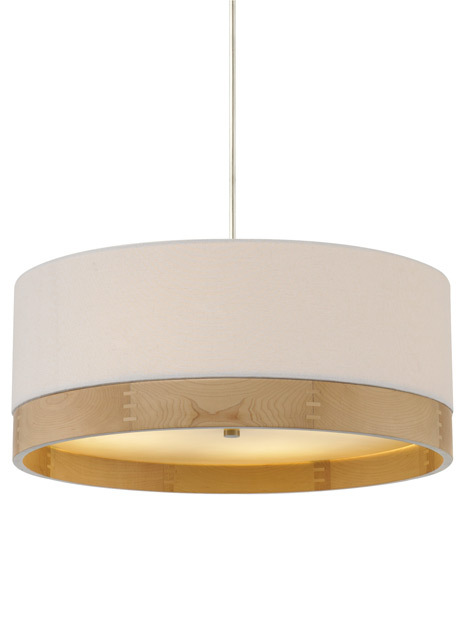 The modern drum shade is elevated to a richer, warmer dimension with a sophisticated combination of fabric and wood. The bands of wood trim are spline-joined around the circumference of the shade – a very delicate feat of quality craftsmanship. A white diffuser is perfectly placed within the shade to ensure even light distribution onto surfaces below. Shade options include, Heather Gray and White, along with two wood trim options and three on-trend hardware finishes, allowing full customization for your unique space. Also available from Tech Lighting is the Topo Pendant and Topo Flush Mount, to find these fixtures simply search for the Topo Suspension to find its nearest relatives. Available lamping options include energy efficient LED or no-lamp, leaving you the option to light this fixture with your preferred lamping. Lamping options are compatible with most dimmers. For a list of compatible dimmers please refer to dimming chart for more information. Rated for (4) 75 watt max. E26 medium base lamps (Lamps Not Included). LED includes (4) 9.5 watt, 800 delivered lumens, 2700K, medium base LED A19 lamps. . Dimmable with most LED compatible ELV and TRIAC dimmers. Integrated ball joint accommodates sloped ceilings up to 45°. Length -- Choose -- 24" 36" 48"